I was sitting in the waiting room at my doctor’s office, and a lady came over and handed me a little white crocheted angel. She said, “I wanted to make sure you received one of my angels.” I took the delicate ornament in my hand and looked around the room at other patients admiring her work. She returned to her seat at the end of the room where she proceeded to make more angels. I pondered this wonderful act of kindness to all of us who were in the waiting room. Most people there knew that room all too well and were awaiting their turn for chemotherapy. I was there for my biweekly anemia test and have observed many acts of love and encouragement during my time there. I don’t know the woman’s name that was crocheting, but all I could think of was how she used her gifts to bless others. I don’t know if she was a patient or was there with a patient, but she glowed with joy as she plied every stitch. 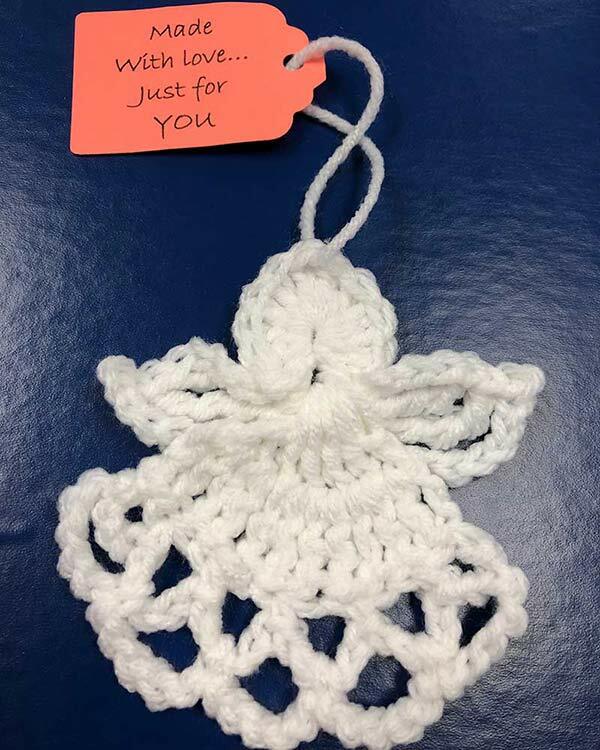 Each seat had an angel placed on it with the little tag “Made with love…just for you.” I will treasure this lovely token and hang it on my tree. It will serve as a reminder to me during the Christmas season that sharing love and encouragement with others should be my goal this season and every season. Everyone has gifts they can share with others. It will change your day and your life when you care enough to bring a bright moment of joy to someone. I now call this precious woman the Stitching Angel, and wish her all the happiness that she has brought to those lucky enough to receive her angels. Life brings us unexpected moments of joy—thank you, Stitching Angel! Have you had a similar experience with random acts of kindness? I used to work with a mother/daughter duo but sadly the mom passed away last year and she left me all her crochet and knitting things. I’m keeping a box full of her yarn, hooks, needle and notebook to make her daughter gifts from her mother and me here and there , she doesn’t know I kept it all safe for her every time it’s a surprise , I just finished a little star in pink , her mom favourite, and I’ll give it to her this week for her tree. I just hope that I bring her a tiny bits of joy and love. Think of all of the lives she has touched with her kindness. Now you have told all of your friends on this site, so the love and kindness will multiply. Thank you for sharing. I have been spending my time crocheting small doilies for gifts to give in the same way, and will have to find a pattern for the angel and other small items to do the same thing. Thanks for sharing. That is such an inspiring story. I knit and crochet, but never thought of doing something like that. Like you, I would put it on my Christmas tree, but after Christmas I would hang it somewhere I could see it every day and remember her and her act of kindness. Also I could pray for her. What a lovely and thoughtful gift. Thank you for sharing. Blessings to you, all your readers and to that wonderful lady who made your angel. I have long believed that if we remain aware we will see that God puts others in our lives at the exact point we need them – or they need us. When I was a little girl, the lady upstairs made a Yo Yo doll’s quilt for my dolls. I still a treasure it and keep it displayed in a doll cradle. She would also tell me stories of her growing up in Holland. It was many years ago but I still remember her kindness to a little inquisitive girl who loved her dolls. While standing in line at the bank, a lady handed me Rosary Beads after she asked if I were Catholic. I still can remember her kind words and gesture. What a warm and touching act of kindness! I think that there should be a website set up for people to share stories like this, because at this point in time we all need a kinder gentler world!!!!! Gup we had a woman who lived in the apartment above us. Every birthday and Christmas she would give my twin and I a small inexpensive gift. She had limited income but never forgot us. Today we wear her Christmas pins on our coats. Obviously, it should be growing up. All year long, I make handmade cards to send to grieving or ill or sad folks who need encouragement and a little love. In my cards, I might include a little piece of money, or a gift card from Dollar Tree. A handwritten note is also included. I am always told how much the cards are appreciated. It makes my day as well. My aunt and grandmother crocheted angels and snowflakes, some of which I still have. Unfortunately, I did not inherit their creative gift. But today as I stood in line to pay for one item, two shoppers allowed me to go ahead of them. As I thanked them, we talked about the Christmas spirit in small acts of kindness. I hand out cards to store clerks and others I meet which say, “You don’t deserve it; you cannot earn it; you just have to accept it. Jesus loves you. Always has. Always will. John 14:6.” The cards always bring a smile and a thank you from the recipient. One store clerk came around the cash register and gave me a huge hug! The Bible tells us that we are to be “doers of the Word, not hearers only. “ Not just at Christmas, but every day! May God bless the lady who makes the angels, and those to whom she gives them. My mother crocheted angels and snowflakes. This morning a cousin and I shared how many people still have her crochet on their Christmas tree – she has been gone 20 years! Yet she is here with us. In a week when my inbox has been filled with messages admonishing me to buy & buy before it is too late, reading about this lovely lady’s thoughtfulness was just the refreshment my soul needed. May God richly bless her. That was so lovely of her .Sometimes i think in our world today that people are so busy with their lives that they forget about others.Just a note to someone shows that you care a small gift like the one she made is special.People need to feel special it does not have to cost a thing a smile for someone or a hug may be all that it takes to brighten their day and it does not cost a thing except the the little time it takes you to do it .So smile at someone today or hug them or both.This world needs more compassion. This would be a wonderful article for your Southern Lady magazine. Everyone has something to offer, we just need to be motivated and encouraged to pass it on. Your magazine is a wonderful platform for this message. You received, now pass it on by planting the seed in an article. I had an older gentleman who handed me a small wooden cross he had carved. No bigger than a fifty cent . He had put it in a small purple netting bag. Asked if I knew god? I answered emphatically yes. I was so astounded by his small act of faith. I keep in in my car and use it as a reminder I never travel alone. Such a small token coming from someone brave enough to share his faith. I saw the joy on his faith. Never saw him again but I will tell you came to me on a day it was needed. You had a chance meeting with an angel. What a thoughtful lady! If only our world had more like her! So nice to hear some happy stories in our world where the news is full of dismal happenings. How sweet! Such a special thing to do. This is beautiful and I thank you so much for sharing. People like the lady in your story, serve to remind us of the good and kindness in our world. They are also a great example to follow and give us inspiration to also scatter love and joy. That is such a touching story! Thank you for sharing. 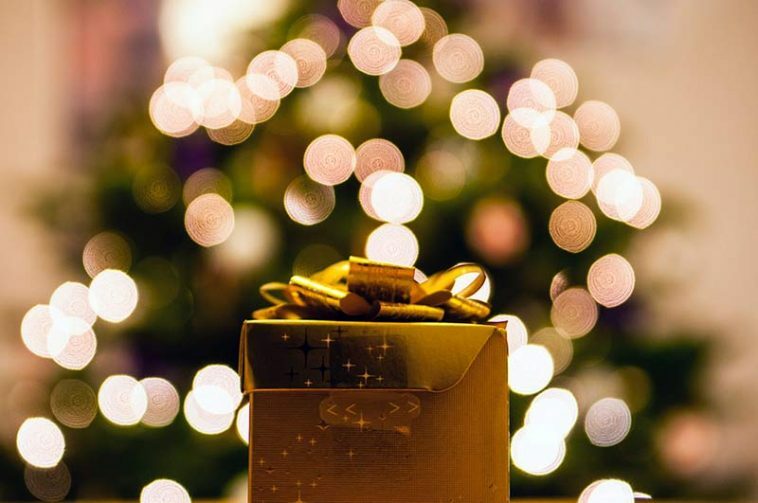 In a time when lots of people are focusing on buying the perfect Christmas gifts, it is so nice to hear (read) of someone giving small tokens of love and kindness.